Here, we present protocols to investigate impairment of the neurovascular unit during experimental autoimmune encephalomyelitis in vivo. We specifically address how to determine blood-brain barrier permeability and gelatinase activity involved in leukocyte migration across the glia limitans. Tietz, S. M., Engelhardt, B. Visualizing Impairment of the Endothelial and Glial Barriers of the Neurovascular Unit during Experimental Autoimmune Encephalomyelitis In Vivo. J. Vis. Exp. (145), e59249, doi:10.3791/59249 (2019). 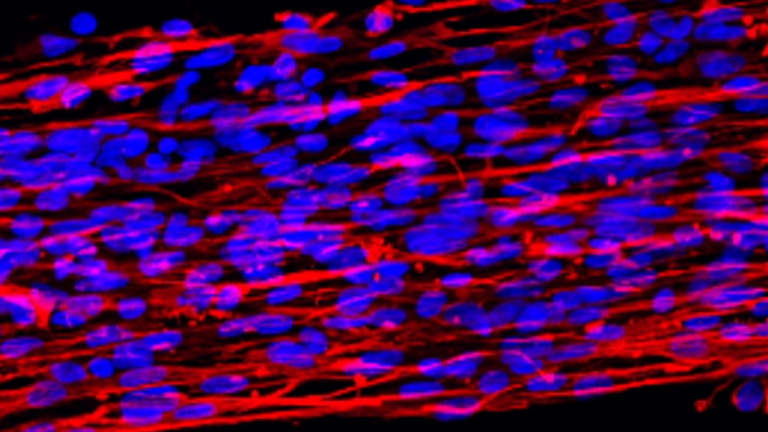 The neurovascular unit (NVU) is composed of microvascular endothelial cells forming the blood-brain barrier (BBB), an endothelial basement membrane with embedded pericytes, and the glia limitans composed by the parenchymal basement membrane and astrocytic end-feed embracing the abluminal aspect of central nervous system (CNS) microvessels. In addition to maintaining CNS homeostasis the NVU controls immune cell trafficking into the CNS. During immunosurveillance of the CNS low numbers of activated lymphocytes can cross the endothelial barrier without causing BBB dysfunction or clinical disease. In contrast, during neuroinflammation such as in multiple sclerosis or its animal model experimental autoimmune encephalomyelitis (EAE) a large number of immune cells can cross the BBB and subsequently the glia limitans eventually reaching the CNS parenchyma leading to clinical disease. Immune cell migration into the CNS parenchyma is thus a two-step process that involves a sequential migration across the endothelial and glial barrier of the NVU employing distinct molecular mechanisms. If following their passage across the endothelial barrier, T cells encounter their cognate antigen on perivascular antigen-presenting cells their local reactivation will initiate subsequent mechanisms leading to the focal activation of gelatinases, which will enable the T cells to cross the glial barrier and enter the CNS parenchyma. Thus, assessing both, BBB permeability and MMP activity in spatial correlation to immune cell accumulation in the CNS during EAE allows to specify loss of integrity of the endothelial and glial barriers of the NVU. We here show how to induce EAE in C57BL/6 mice by active immunization and how to subsequently analyze BBB permeability in vivo using a combination of exogenous fluorescent tracers. We further show, how to visualize and localize gelatinase activity in EAE brains by in situ zymogaphy coupled to immunofluorescent stainings of BBB basement membranes and CD45+ invading immune cells. The central nervous system (CNS) coordinates all body and mental functions in vertebrates, and CNS homeostasis is essential for a proper communication of neurons. CNS homeostasis is warranted by the neurovascular unit (NVU), which protects the CNS from the changing milieu of the blood stream. The NVU is composed of CNS microvascular endothelial cells, which are biochemically unique and establish the blood-brain barrier (BBB) in continuous crosstalk with pericytes, astrocytes, neurons, and extracellular matrix (ECM) components, establishing two distinct basement membranes1. The endothelial basement membrane that ensheathes the abluminal aspect of the BBB endothelial cells harbors a high number of pericytes and is composed of laminin α4 and laminin α5, in addition to other ECM proteins2. In contrast, the parenchymal basement membrane consists of laminin α1 and laminin α2 and is embraced by astrocytic end-feet. The parenchymal basement membrane together with the astrocyte end-feet composes the glia limitans that segregates the CNS neuronal network from the cerebrospinal fluid filled perivascular or subarachnoid spaces3. Due to the unique architecture of the NVU, immune cell trafficking into the CNS is distinct from that into peripheral tissues as it requires a two-step process with the immune cells, first breaching the endothelial BBB and subsequently the glia limitans in order to reach the CNS parenchyma. Multiple sclerosis (MS) is a common neuroinflammatory disease of the CNS, in which a large number of circulating immune cells enter the CNS and cause neuroinflammation, demyelination, and focal loss of BBB integrity4. Loss of BBB integrity is an early hallmark of MS, as indicated by the presence of gadolinium contrast enhancing lesions in the CNS as visualized by magnetic resonance imaging (MRI)5. Leukocyte extravasation into the CNS occurs at the level of postcapillary venules; however, the precise mechanisms involved in immune cell diapedesis across the BBB basement membrane and subsequently the glial barrier remain to be explored. Experimental autoimmune encephalomyelitis (EAE) serves as an animal model for MS and has significantly contributed to our current knowledge about MS pathogenesis. For instance, using the EAE model it has been discovered that leukocyte extravasation occurs in a multistep process, including an initial capture and rolling step mediated by selectins and mucin-like molecules such as P-selectin glycoprotein ligand (PSGL)-1, followed by integrin-dependent firm arrest and crawling of T cells on BBB endothelial cells to permissive sides for diapedesis6. Once T cells have crossed the endothelial BBB and the endothelial basement membrane, they need to encounter their cognate antigen on macrophages or dendritic cells strategically localized in the leptomeningeal or perivascular spaces. This interaction induces focal production of pro-inflammatory mediators that trigger the subsequent mechanisms required for CNS tissue invasion of immune cells via the glia limitans7,8,9. Focal activation of matrix-metalloproteinases (MMP) -2 and MMP-9 alters chemokine activation and induces degradation of extracellular matrix receptors on astrocyte end-feet, which is a prerequisite for immune cell migration across the glia limitans into the CNS parenchyma and to induce the onset of clinical symptoms of EAE10,11. Combining detection of CNS infiltrating immune cell with BBB leakage and gelatinase activity in CNS tissue sections provides valuable information about the functional integrity of the endothelial and glial barrier in the context of neuroinflammation. For instance, we recently investigated the constitutive loss of the endothelial tight junction molecule junctional adhesion molecule (JAM)-B in immune cell trafficking into the CNS in the context of EAE. Compared to healthy wild-type C57BL/6 mice, healthy JAM-B-deficient littermates showed no impairment of BBB integrity as shown by in vivo permeability assessment using endogenous as well as exogenous tracers12. In the context of EAE, JAM-B-deficient C57BL/6 mice showed ameliorated disease symptoms, which was associated with inflammatory cell trapping in the leptomeningeal and perivascular spaces12. To examine this phenomenon we applied in situ zymography, allowing identification of gelatinase activity in order to test if lack of gelatinase activity in JAM-B-deficient mice may be responsible for the reduced numbers of immune cells able to breach the glia limitans12. Given the availability of different genetically modified mouse models lacking, e.g., different BBB tight junction molecules that might cause changes in BBB function, methodologies for investigating BBB integrity are important. In addition, newly developed drugs could impact on NVU barriers. Here we show how to induce EAE in C57BL/6 mice by active immunization with the myelin oligodendrocyte glycoprotein (MOG)-peptide aa35-55 in complete Freund’s adjuvants. We then explain how to localize immune cell infiltration across the endothelial and glial barriers of the NVU and how to study in vivo endothelial and glial barrier integrity by in situ detection of exogenous tracers and gelatinase activity, respectively. All studies were conducted under the guidelines according to the Swiss legislation on the protection of animals and were approved by the Veterinary Office of the Canton of Bern, Switzerland (permission numbers: BE 31/17 and BE 77/18). House mice in individual ventilated cages with a 12/12 h light-dark cycle. Provide food and water ad libidum. To supervise microbiological quality of the mice, the experimental cohort underwent quarterly health monitoring by dirty bedding sentinels following FELASA recommendations13. Use ear punches to individually mark 8-12 week old female C57BL/6 mice. For Complete Freund’s Adjuvant (CFA), mix 30 mL of Incomplete Freund’s Adjuvant with 120 mg of freshly pestled heat inactivated Mycobacterium tuberculosis (H37RA) under a fume hood. Store stock solution at 4 °C. For the MOGaa35-55-peptide stock solution, dissolve MOGaa35-55-peptide in sterile PBS (4 mg/mL) and store at -80 °C. Dilute CFA 1:2 with MOG-peptide stock solution in a 2 mL microtube. Seal the microtube with sealing film and fix on a Vortex mixer by completely covering the tube with adhesive tape. Vortex emulsion for 4 h at 4 °C. Take the microtube and quickly spin down the emulsion using a small table centrifuge. Collect emulsion into a syringe using a 18G x 1½’’ (1.2 mm x 40 mm) injection needle. According to the number of mice adjust the emulsion volume in the syringe (100 µL/mouse) and replace the 18G needle with a 27G x ¾’’ (0.4 mm x 19 mm) injection needle. Seal the injection needle attached to the syringe with sealing film. For the pertussis toxin (PTx) stock solution, dissolve 50 µg of lyophilized PTx in 500 µL of sterile PBS (100 ng/µL). Store stock solution at 4 °C. For the PTx working solution, mix 97 µL of sterile PBS with 3 µL of PTx stock solution (300 ng/100 µL) per mouse (for intraperitoneal injection use a 30G x ½’’ (0.3 mm x 13 mm) needle). Anesthetize C57BL/6 mice with isofluorane using a vaporizer system. To induce anesthesia in mice, expose the mouse to 4.5% isofluorane in oxygen in a small incubation chamber before transferring the mouse to a facemask with 2.1% isofluorane. Use an anesthesia unit equipped with heating pad to prevent hypothermia of the mouse. Fix the anesthetized mouse in one hand and first inject 30 µL of MOG35-55/CFA-emulsion subcutaneously into hind leg flanks (Figure 1: 1 + 2; in total 60 µL; left flank 30 µL and right flank 30 µL) in close proximity to the inguinal lymph nodes. 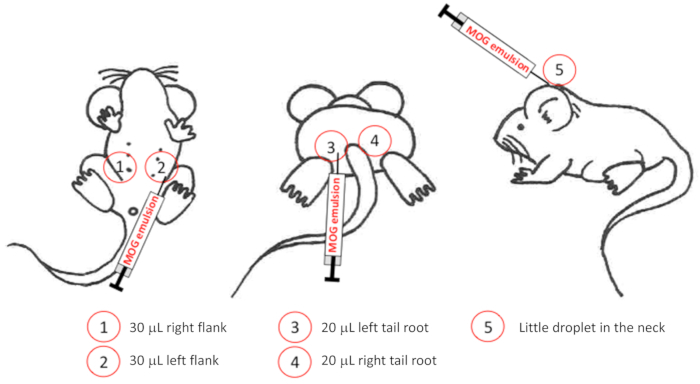 Place the mouse on its belly and inject 20 µL of MOGaa35-55/CFA-emulsion into the left and right soft fatty tissue at the tail root (Figure 1: 3 + 4; in total 40 µL; left side tail root 20 µL and right side tail root 20 µL) and a little droplet of MOGaa35-55/CFA-emulsion into the neck of the mouse (Figure 1: 5). Inject 100 µL of PTx solution intraperitoneally into the mouse. Hold the head of the mouse below the body center avoiding injection into the intestine. Replace maintenance diet (extrudate major nutrients: crude protein 18.5%; crude fat 4.5%; crude fiber 4.5%; crude ash 6.5%; starch 35%; metabolic energy: 13.1 MJ/kg) to breeding diet (extrudate major nutrients: crude protein 23.5%; crude fat 5.5%; crude fiber 3%; crude ash 5.7%; starch 36%; metabolic energy: 14.3 MJ/kg) in order to provide the mice with food of higher energy content before and during the expected clinical disease. Remove the face mask and transfer the mouse to its home cage with a warming pad. Make sure the mouse is fully awake and motile after 10 minutes. Repeat the PTx injection (2.2.4) 48 h after the first treatment. Check the health status of EAE mice every morning by taking a look inside the cages. Score EAE mice every afternoon. Take every individual mouse included in the EAE experiment out of the cage and check whether the tail has tonus by moving it upward with a finger. A healthy mouse will keep its tail up (the tail has a tonus). If clinical EAE has started, the tail tonus will be lower, visible by a gradual drop of the tail. Eventually the mouse will not be able to lift its tail at all. Place every individual mouse included in the EAE experiment on the clean bench and observe and document the walking behavior. See Table 115 for scoring criteria for the assessment of disease severity (the EAE score). Assess and document the weight of every mouse included in the experiment. To ensure adequate food and water uptake by mice displaying a clinical EAE score of 1 supply moistened food in a plastic dish on the bottom of the cage and refresh daily. For dextran stock solutions, dissolve 10 mg of 10 kDa Dextran Alexa Fluor 488 as well as 3 kDa Dextran Texas Red in 500 µL of 0.9% sodium chloride solution (20 mg/mL). For the dextran working solution, just before injection pipet 55 µL of 10 kDa Dextran Alexa Fluor 488 stock solution (20 mg/mL) onto a piece of sealing film and add 55 µL of 3 kDa dextran Texas Red stock solution (20 mg/mL). Mix and collect 100 µL into a disposable fine syringe (final concentration 2 mg/100 µL). For the 10% formaldehyde (PFA) stock solution, combine 10 g of PFA extra pure powder, 100 mL of PBS, and 200 µL of 1N NaOH in a clean glass beaker and heat up to precisely 56 °C under stirring using a magnetic stirrer; keep at 56 °C for 30 min until the PFA is completely dissolved; cool down to room temperature; adjust pH to 7.4; and filter through a paper filter. Store at - 20 °C. The stock solution can be diluted further using PBS. Shortly anesthetize healthy C57BL/6 mice or C57BL/6 mice suffering from EAE with isoflurane (the mouse will be sedated for approximately 1 min). Use an automated system as in step 2.2.1 (mice will be exposed to 4.5% isoflurane in oxygen in an induction chamber and then transferred to a facemask with 2.1% isoflurane). Place the anesthetized mouse in lateral position on the table, then intravenously (e.g. retro-orbitally) inject 100 µL of fluorescent tracers into the mouse before the mouse wakes up. Immediately remove the facemask and make sure the mouse is fully awake and motile after the short anesthesia. Let the tracer circulate for 15 min. Begin the procedure 15 min after fluorescent tracer injection by inducing deep isoflurane anesthesia. To induce deep anesthesia in mice use 2.3% of isoflurane in oxygen. Use the paw withdrawal reflex to judge the depth of the anesthesia (pinch the skin between the toes; a lack of flexion indicates a sufficient depth), and probe the reflexes of both the forelimb and the hindlimb in mice subjected to EAE. Fix the mouse on its back and spray the belly with ethanol. Open the thorax using a scissor and remove the diaphragm. Open the right atrium of the beating heart using a scissor and perfuse the mouse through the left ventricle of the heart with 10 mL of PBS followed by 10 mL of 4% PFA in PBS. CAUTION: To avoid inhaling PFA, perfuse the mouse in a fume hood. Induce deep isoflurane anesthesia using 2.3% isoflurane in oxygen in a mouse suffering from EAE, and check the depth of anesthesia as in step 5.1.1. Next, fix the mouse on its back and spray the belly with ethanol. Open the thorax using a scissor and remove the diaphragm. Open the right atrium of the beating heart using a scissor and perfuse the mouse through the left ventricle of the heart with 20 mL of PBS. Fill a flat dewar container with crushed dry ice and add 2-methylbutane (Isopentane) until the liquid reaches about 1 cm above the dry ice pack. Cover with a loose lid – e.g., an ice bucket cover. Clip off the head of the perfused mouse with sharp scissors and remove skin and ears using a smaller set of scissors. Carefully dissect the skullcap by cutting from the foramen magnum towards the front at the left and the right side allowing to upfold the skullcap over the brain. Then, carefully lift out the intact brain from the base of the skull while severing the optical nerves using a flat metal spatula. Place brain on aluminum foil and cut the brain in three pieces (frontal brain, middle brain, and cerebellum + brain stem) by placing two coronal cuts. Fill a cryomold (25 mm x 20 mm x 5 mm) to the first quarter with optimum temperature cutting (O.C.T.) matrix, place brain slices with the anterior side of each brain piece facing downwards into the cryomold, and cover tissue completely with O.C.T. matrix. Place the cryomold with the tissue in a horizontal orientation into the 2-Methylbutane bath and make sure that the tissue freezes from the bottom to the top within 1 minute by avoiding dipping the entire tissue block into the bath. Transfer frozen tissue to -80 °C for storage and proceed with section 7. Equilibrate temperature from frozen tissue from -80 °C to -20 °C in the cryostat for 30 min. Remove tissue block from the cryomold and mount on the cryostat tissue holder (set to -15 °C) using O.C.T. matrix. Trim the edges of the tissue block on the holder of the cryostat with a sharp scalpel, and start cutting into the tissue block by removing 20 µm sections with the cryostat knife until the tissue is visible. Cut 6-10 µm tissue sections, collect them on adhesion glass slides, and immediately image the sections covered with a cover slip using a fluorescence microscope. Assess appearance of blood vessels in the brain (pay attention to sharp borders of non-leaky blood vessels compared to diffuse fluorescence patterns observed for leaky blood vessels). As positive control, verify the leakage of the tracer into the stroma of the circumventricular organs or the choroid plexus which lack a BBB. Cut 6 µm tissue sections using a cryostat, collect them on adhesion glass slides, and freeze tissue sections at -20 °C in a freezing box containing silica gel in the lid. Mix 6 g of glycerol (analytical grade), 2.4 g of poly(vinyl alcohol), 6 mL of ddH2O, and 12 mL of 0.2 M Tris buffer, pH 8, and stir (magnetic stirrer) the solution for 4 h at RT. Transfer the solution to a 50 mL centrifuge tube and let it rest for 2 h at RT. Subsequently incubate the solution for 10 min at 50 °C (water bath) and centrifuge for 20 min at 2,700 x g at room temperature. Take the supernatant and freeze in aliquots at -20 °C. Dissolve 0.1 g of cold gelatin from bovine skin in 10 mL of ddH2O. Let it soak for at least 1 day and store aliquots at 4 °C. Put 100% methanol in a coplin jar and cool down to -20 °C. Add 1 g of sodium azide to 10 mL of ddH2O and store at room temperature. Mix 99 µL of ddH2O with 1 µL of 10% sodium azide stock solution. Dissolve 1 mg of fluorescein conjugated dye-quenched (DQ) gelatin from pig skin in 1 mL of sodium azide working solution and store 100 µL aliquots protected from light at 4 °C. Dissolve 30 mg of 1,10-phenanthroline monohydrate in 76 µL of ethanol and store at -20 °C. Add 1 tablet of EDTA free protease inhibitor to 2 mL of ddH2O. Store at -20 °C. Centrifuge the 1 mg/mL DQ gelatin solution for 5 min at 13,300 x g.
Mix 127.2 µL of ddH2O, 15 µL of 10x reaction buffer (Gelatinase/Collagenase Assay Kit; see Table of Materials), 0.3 µL of 20 mg/mL cold gelatin, 1.5 µL of 1 mg/mL DQ gelatin, and 6 µL of 25x protease inhibitor solution. Mix 125.2 µL of ddH2O, 15 µL of 10x reaction buffer, 0.3 µL of 20 mg/mL cold gelatin, 1.5 µL of 1 mg/mL DQ gelatin, 6 µL of 25x protease inhibitor EDTA free, and 2 µL of 2 M 1,10-phenantroline (MMP inhibitor). Mix 128.7 µL of ddH2O, 15 µL of 10x reaction buffer, 0.3 µL of 20 mg/mL cold gelatin, and 6 µL of EDTA-free 25x protease inhibitor. Prepare primary antibody cocktail for counterstaining, for example, 0.95 µg/mL polyclonal rabbit anti-laminin antibody and 10 µg/mL polyclonal rat anti-CD45 antibody in 1% BSA in PBS, and prepare appropriate isotype control primary antibody cocktails. Prepare secondary antibody solution, for example, 7.5 µg/mL Cy3 goat anti-rat + 15 µg/mL AMCA anti-rabbit in 1% BSA in PBS (protect from light). Prepare reaction solutions (steps 8.1.9-8.1.11), centrifuge for 5 min at 13,400 x g at room temperature, and pre-warm to 37 °C using a water bath. Rehydrate the tissue sections for 5 min at 37 °C using 1x reaction buffer. Then, pour off the 1x reaction buffer, add reaction solution on the tissue sections, and incubate for 4 h at 37 °C. Wash slides 5 times in ddH2O. Fix sections for 5 min with ice-cold methanol at -20 °C and afterwards wash sections once with PBS at room temperature. Add 1% BSA in PBS to the sections and incubate for 20 min at room temperature (protect from light). Then, discard 1% BSA in PBS from the sections by flipping the slides on tissue, add primary antibody cocktail, and incubate for 1 h at room temperature (protect from light). Wash sections twice with PBS, add secondary antibody cocktail, and incubate for 1 h at room temperature (protect from light). Wash sections twice with PBS, mount the slides with embedding solution, let mounted sections dry over night at room temperature (protect from light). Finally, analyze stained tissue sections using a fluorescent microscope. Assessment of the clinical course of EAE in C57BL/6 mice should result in a disease curve as depicted in Figure 2A and changes in the mouse body weight as presented in Figure 2B. C57BL/6 mice immunized with MOGaa35-55 usually start to develop disease symptoms around day 10-12 after active immunization (Figure 1A). Typically, immunized mice show a transient drop of body weight the day after the injection of the emulsion and the first dose of pertussis toxin (Figure 1B). From day 2 after EAE induction, the body weight of immunized mice then gradually increases until the disease starts, when the body weight typically drops one day prior to the development of clinical symptoms and continues to decrease correlating to the increasing disease symptoms (Figure 1A,B). The EAE disease severity increases until the peak of the disease, which can be expected between days 16 and 20 after EAE induction (Figure 2A). At the peak of clinical EAE, mice also show the lowest body weight (Figure 2B), which increases in correlation to amelioration of EAE in the remission phase of the disease (Figure 2A,B). EAE induction in C57BL/6 mice using MOGaa35-55 results in a chronic disease pathology, and mice typically do not fully recover (Figure 1A). Figure 3A shows a representative picture of the choroid plexus and the adjacent brain parenchyma of a C57BL/6 mouse suffering from EAE that was intravenously injected with fluorescent 3 kDa Dextran (red) and 10 kDa Dextran (green) 15 min before sacrificing; scale bar 50 µm. As we have previously demonstrated, tracers readily diffuse across the fenestrated microvessels into the stoma of the choroid plexus (left and middle picture), while the BBB does not allow the diffusion of circulating tracers into the brain parenchyma, indicated by the dashed line (right picture), which is thus devoid of any fluorescent signal. Figure 3B shows representative leaky blood vessels in the cerebellum of a C57BL/6 mouse suffering from EAE that was intravenously injected with fluorescent 3 kDa Dextran (red) and 10 kDa Dextran (green) 15 min before sacrificing. Arrow heads indicate tracers diffused across the brain microvessels into the CNS parenchyma (left and middle picture), suggesting that the BBB function is impaired in these vessels. In the CNS parenchyma, green and red fluorescent signal is visible outside of the blood vessel walls, which are indicated by dashed lines. In EAE, in the cerebellum where inflammatory cuffs appear the tracers can also be found in the perivascular space between the endothelial basement membrane and the glia limitans indicating functional loss of endothelial BBB integrity. If tracer is found to diffuse into the brain parenchyma, it shows additional dysfunction of the glial barrier12. Figure 4 shows representative pictures of the analysis of gelatinase (MMP) activity in an EAE brain of a C57BL/6 mouse visualized by in situ zymography and localized to specific brain barrier compartments by anti-pan-laminin (blue) and to the presence of inflammatory cells by anti-CD45 (red) immunofluorescence staining. Proteolytic cleavage of dye-quenched (DQ) gelatin unquenches a fluorescein signal, which allows localization of gelatinase activity on the tissue section. When cold gelatin (non-fluorescent control) is incubated, no green fluorescent signal can be detected in the brain sections from the EAE mice (upper row) as well as in sections that have been incubated with DQ-gelatin combined with phenantroline, a potent Zn+-complexing agent and MMP inhibitor (middle row). In the lower row, focal gelatinase/MMP activity is visible as typical granular bright green fluorescence signal, as highlighted by the arrowheads. In inflammatory cuffs in the cerebellum of an EAE mouse, specific MMP activity occurs beyond the glia limitans (blue) at sites of inflammatory cell infiltration (red). Figure 1: Graphical representation of injection sites for EAE induction. 1) Injection site for 30 µL MOG-emulsion into the right flank, 2) injection site for 30 µL MOG-emulsion into the left flank, 3) injection site for 20 µL MOG-emulsion into the left tail root, 4) injection site for 30 µL MOG-emulsion into the right tail root, 5) injection site for a little droplet of MOG-emulsion into the neck. Please click here to view a larger version of this figure. Figure 2: Representative course of EAE. (A) Disease symptoms of EAE in C57BL/6 mice over time. Mean +/- SEM is shown. (B) Change of body weight during EAE over time. Mean +/- SEM is shown. Please click here to view a larger version of this figure. Figure 3: Representative picture of in vivo permeability. 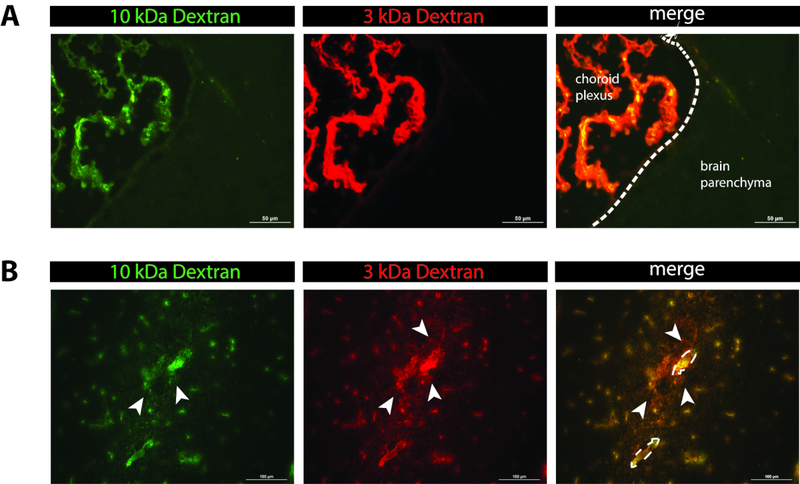 (A) Left picture: green fluorescent 10 kDa dextran at the level of the choroid plexus. Middle picture: red fluorescent 3 kDa dextran at the level of the choroid plexus. Right picture: Merge of the left and middle pictures. Scale bar 50 µm. (B) Left picture: green fluorescent 10 kDa dextran in the mouse cerebellum. Middle picture: red fluorescent 3 kDa dextran in the mouse cerebellum. Right picture: merge of the left and middle pictures. Dashed lines are indicative for blood vessel walls; arrow heads point to fluorescent tracers in the CNS parenchyma. Scale bar 100 µm. Please click here to view a larger version of this figure. Figure 4: Representative pictures of in situ zymography. First column: green fluorescent channel (unquenched signal of dye-quenched (DQ) gelatin). Second column: blue fluorescent channel (laminin). Third column: red fluorescent channel (CD45). Fourth column: merge of fluorescent channels. Upper row: cold gelatin (non-fluorescent) negative control. Middle row: phenantroline (MMP-inhibitor) negative control. Lowest row: DQ gelatin. Scale bar 100 µm. Please click here to view a larger version of this figure. Table 1: Scoring criteria for the assessment of EAE disease severity. Here, we present a protocol to induce and monitor EAE in female C57BL/6 mice. Females are preferentially chosen, and there is a incidence of women : men of 3:1 in MS. To assess the severity of EAE, we made use of a 3-point scoring sheet. EAE severity is generally scored with respect to the severity of motor dysfunctions. Mice with advanced stages of EAE, i.e. exhibiting a score above 2 should be sacrificed to avoid unnecessary suffering of the animals. Thus, it is recommended to score the mice at close intervals e.g. twice daily as explained in the protocol. There are several scoring routines employed, reaching from 0-3 points to 0-6 points16,17,18,19 or even more subpoints20. However, we have previously shown that supposedly refined EAE scoring does not lead to any improvement in determining potential statistically significant differences in disease scores between groups, when considering the overall disease severity15. Based on this observation we made use of the 3-point scale to assess disease progression in EAE in order to reduce mouse handling time and thus, distress for mice implementing the 3R rules. Another critical point using the EAE model to study differences between knockout and wild-type mice or differences between treatment groups is setting up a precise experimental planning. When wild-type mice are compared to knockout mice, it is essential to compare littermates originating from heterozygous matings to ensure identical genetic backgrounds of the wild-type and knockout mice compared in the EAE experiment. It is also important to keep the same conditions for all mice included in an experiment, e.g. cage changes, administration of wet food, and especially mouse housing (health state) conditions. In order to avoid cage-specific phenomena induced by the investigator, cross-immunization should be performed. More precisely, if more than one syringe is needed to immunize a certain number of mice, they should be randomly assigned to different syringes used. The latter likewise should be applied for the performance of treatment studies. Last but not least, the health status of mice housed in different animal facilities might impact on disease incidence and severity and thus more21 or less Mycobacterium tuberculosis22 might be required to induce a proper clinical disease. Furthermore, the site of injection may impact on disease development. In this protocol we propose to inject relatively small volumes into five different subcutaneous sites: 30 µL into two flanks, 20 µL into the left and right tail root, and a little droplet into the neck. In other protocols, 50 µL depots are placed subcutaneously into the tail root only23 or into the four flanks21. Injections of smaller depots, however, minimize the risk of causing skin irritation, which mice may try to scratch. In vivo permeability might be performed to assess BBB leakage during EAE but also to assess whether the specific genetic deletion of a molecule or a drug treatment impacts on BBB integrity in vivo. This can be performed either by the detection of endogenous plasma tracers such as IgG deposits12 or exogenous trances that are applied into the circulation of an alive mouse24. In this protocol we made use of two different exogenous tracers (3 kDa and 10 kDa Dextran) that were simultaneously injected and allowed to circulate for a defined time of 15 min. Using two tracers with different sizes allows to determine the severity of the BBB dysfunction and may allow to define a cutoff for tracer sizes that diffuse or not across the BBB. Fluorescent dextrans are hydrophilic polysaccharides characterized by good water solubility, low toxicity, and relatively low immunogenicity. Furthermore, dextrans are composed of poly-(α-D-1,6 glucose), which are resistant to cleavage by endogenous cellular glycosidases. We here used dextran variants that have lysine residues incorporated into the dextran conjugate. Lysinated dextrans are aldehyde fixable, which allows to fix the tracer in the tissue. Besides fluorescently labeled dextrans, other chemicals can be used to assess in vivo permeability, e.g., Hoechst dye in combination with Evan’s blue, which binds to a large part to serum albumin. Hoechst stains the BBB endothelial cell nuclei lining CNS microvessels, and Evan’s blue can be detected in the perivascular space upon BBB dysfunction and diffuses further when the glia limitans is disturbed25,26. In contrast, assessing in vivo permeability by immunofluorescent staining of endogenous markers provides insight into accumulation of, e.g., IgG molecules or fibrinogen, a glycoprotein that circulates in the blood, over time. In healthy conditions, the perivascular space is very narrow and the endothelial basement membrane and the glia limitans are closely connected and, thus, visualizing the two ECM barriers of the NVU requires laminin isoform-specific antibody staining27. Endogenous IgG molecules are present during health and disease inside the blood vessels as well as in the tissue of circumventricular organs, where no BBB is established12. In gene modified mice with brain barrier defects, during drug treatment, or during neuroinflammation endogenous molecules that normally circulate in the blood might be deposited in the CNS parenchyma, which can be visualized by counterstaining with anti-laminin antibodies either recognizing all laminin isoforms (pan-laminin antibodies) or laminin isoform-specific antibodies allowing to differentiate laminins, laminin α4 and α5 from the endothelial basement membrane and laminin α1 and laminin α2 from the glia limitans. During neuroinflammatory conditions the perivascular space might be widened by infiltrating immune cells allowing to identify both, the endothelial basement membrane and the glia limitans using a pan-laminin antibody. Counterstaining of laminins present at the NVU allows to assess whether endogenous but also exogenous tracers are deposited in the CNS parenchyma and counterstaining of CD45 allows to assess whether focal leakage of the BBB is associated with immune cell infiltration. Immune cell migration into the CNS parenchyma requires the sequential crossing of two distinct barriers within the NVU, the endothelial BBB, and subsequently the glia limitans28. Crossing the glia limitans and CNS entry of immune cells correlates with the onset of clinical EAE29, while CNS infiltrating cells trapped in leptomeningeal and perivascular spaces do not trigger clinical EAE. Immune cell trapping in leptomeningeal and perivascular spaces between basement membranes has been observed in several gene-modified mouse models e.g. L-selectin knockout mice30, TNF knockout mice23, MMP2/MMP9 double knockout mice10, and JAM-B knockout mice12. These findings underscore that lack of these molecules does not affect immune cell migration across the BBB but rather across the glia limitans, underscoring that molecular mechanisms mediating immune cell migration across the BBB and the glia limitans are distinct. Brain in situ zymography is a methodology to investigate for focal gelatinase activity in a tissue section in precise spatial correlation to CNS pathology. Detection of in vivo BBB permeability together with performing in situ zymography to detect MMP2/MMP9 activity thus allows to delineate endothelial versus glia barrier disturbance in correlation to immune cell infiltration. Combined with pan-laminin and CD45 immunofluorescence staining on EAE brain sections, it allows both localization of gelatinase activity by unquenching DQ-gelatin and localization of infiltrating immune cells at the same time. Unquenching of fluorescein from DQ-gelatin results in a typical granular bright green fluorescence signal, while patchy dimly green fluorescent areas on tissue sections have to be considered as unspecific signal12. Thus, careful evaluation of tissue sections and proper controls are indispensable when performing in situ zymography. In this protocol, we performed in situ zymography in combination with CD45 and laminin staining. Primary antibodies against both CD45 and laminin were incubated as a mix at the same time. Similarly, secondary antibodies were incubated as a mix in a second staining step. Such a combination of antibodies needs testing to ensure that second stage antibodies are absorbed against other IgGs in order to avoid cross-reactivity. Taken together, the protocols presented here provide tools to investigate in detail which element of the NVU is impaired in neuroinflammatory conditions of EAE. In vivo permeability assessment by exogenous tracers allows to identify current impairment of microvascular endothelial cell integrity or current impairment of the NVU. In addition, introduction of tracers with different sizes enables to estimate the severity of BBB impairment. Additional in situ zymography uncovers focal gelatinase activity in astrocytes and potentially inflammatory cells, which is needed to breach the glia limitans as a last barrier before getting access to the CNS parenchyma10. We gratefully acknowledge Lydia Sorokin, who has shared her original in situ zymography protocol10 with us. Tietz, S., Engelhardt, B. Brain barriers: Crosstalk between complex tight junctions and adherens junctions. Journal of Cell Biology. 209, 493-506 (2015). Wu, C., et al. Endothelial basement membrane laminin alpha5 selectively inhibits T lymphocyte extravasation into the brain. Nature Medicine. 15, 519-527 (2009). Hannocks, M. J., et al. Molecular characterization of perivascular drainage pathways in the murine brain. Journal of Cerebral Blood Flow & Metabolism. 38, 669-686 (2018). Kermode, A. G., et al. Breakdown of the blood-brain barrier precedes symptoms and other MRI signs of new lesions in multiple sclerosis. Pathogenetic and clinical implications. Brain. 113, (Pt 5), 1477-1489 (1990). Tommasin, S., Gianni, C., De Giglio, L., Pantano, P. Neuroimaging techniques to assess inflammation in Multiple Sclerosis. Neuroscience. (2017). Lopes Pinheiro, M. A., et al. Immune cell trafficking across the barriers of the central nervous system in multiple sclerosis and stroke. Biochimica Biophysica Acta. 1862, 461-471 (2016). Bartholomaus, I., et al. Effector T cell interactions with meningeal vascular structures in nascent autoimmune CNS lesions. Nature. 462, 94-98 (2009). Kyratsous, N. I., et al. Visualizing context-dependent calcium signaling in encephalitogenic T cells in vivo by two-photon microscopy. Proceedings of the National Academy of Sciences of the United States of America. 114, E6381-E6389 (2017). Lodygin, D., et al. A combination of fluorescent NFAT and H2B sensors uncovers dynamics of T cell activation in real time during CNS autoimmunity. Nature Medicine. 19, 784-790 (2013). Agrawal, S., et al. Dystroglycan is selectively cleaved at the parenchymal basement membrane at sites of leukocyte extravasation in experimental autoimmune encephalomyelitis. Journal of Experimental Medicine. 203, 1007-1019 (2006). Song, J., et al. Focal MMP-2 and MMP-9 activity at the blood-brain barrier promotes chemokine-induced leukocyte migration. Cell Reports. 10, 1040-1054 (2015). Tietz, S., et al. Lack of junctional adhesion molecule (JAM)-B ameliorates experimental autoimmune encephalomyelitis. Brain, Behavior, and Immunity. 73, 3-20 (2018). Mähler Convenor, M., Berard, M., Feinstein, R., Gallagher, A., Illgen-Wilcke, B., Pritchett-Corning, K., Raspa, M. FELASA working group on revision of guidelines for health monitoring of rodents and rabbits. FELASA recommendations for the health monitoring of mouse, rat, hamster, guinea pig and rabbit colonies in breeding and experimental units. Lab Anim. 48, (3), 178-192 (2014). Bittner, S., Afzali, A. M., Wiendl, H., Meuth, S. G. Myelin oligodendrocyte glycoprotein (MOG35-55) induced experimental autoimmune encephalomyelitis (EAE) in C57BL/6 mice. Journal of Visual Experiments. (2014). Tietz, S. M., et al. Refined clinical scoring in comparative EAE studies does not enhance the chance to observe statistically significant differences. European Journal of Immunology. 46, 2481-2483 (2016). Mendel, I., Kerlero de Rosbo, N., Ben-Nun, A. A myelin oligodendrocyte glycoprotein peptide induces typical chronic experimental autoimmune encephalomyelitis in H-2b mice: fine specificity and T cell receptor V beta expression of encephalitogenic T cells. European Journal of Immunology. 25, 1951-1959 (1995). Miller, S. D., Karpus, W. J. Experimental autoimmune encephalomyelitis in the mouse. Current Protocols in Immunology. 15, Chapter 15 Unit 14 (2007). Sobel, R. A., Tuohy, V. K., Lu, Z. J., Laursen, R. A., Lees, M. B. Acute experimental allergic encephalomyelitis in SJL/J mice induced by a synthetic peptide of myelin proteolipid protein. Journal of Neuropathology & Experimental Neurology. 49, 468-479 (1990). Westarp, M. E., et al. T lymphocyte line-mediated experimental allergic encephalomyelitis--a pharmacologic model for testing of immunosuppressive agents for the treatment of autoimmune central nervous system disease. Journal of Pharmacology and Experimental Therapeutics. 242, 614-620 (1987). Klotz, L., et al. B7-H1 shapes T-cell-mediated brain endothelial cell dysfunction and regional encephalitogenicity in spontaneous CNS autoimmunity. Proceedings of the National Academy of Sciences of the United States of America. 113, E6182-E6191 (2016). Tietz, S. M., et al. MK2 and Fas receptor contribute to the severity of CNS demyelination. PLoS One. 9, e100363 (2014). Coisne, C., Mao, W., Engelhardt, B. Cutting edge: Natalizumab blocks adhesion but not initial contact of human T cells to the blood-brain barrier in vivo in an animal model of multiple sclerosis. Journal of Immunology. 182, 5909-5913 (2009). Korner, H., et al. Critical points of tumor necrosis factor action in central nervous system autoimmune inflammation defined by gene targeting. Journal of Experimental Medicine. 186, 1585-1590 (1997). Krueger, M., et al. Blood-brain barrier breakdown involves four distinct stages of vascular damage in various models of experimental focal cerebral ischemia. Journal of Cerebral Blood Flow & Metabolism. 35, 292-303 (2015). 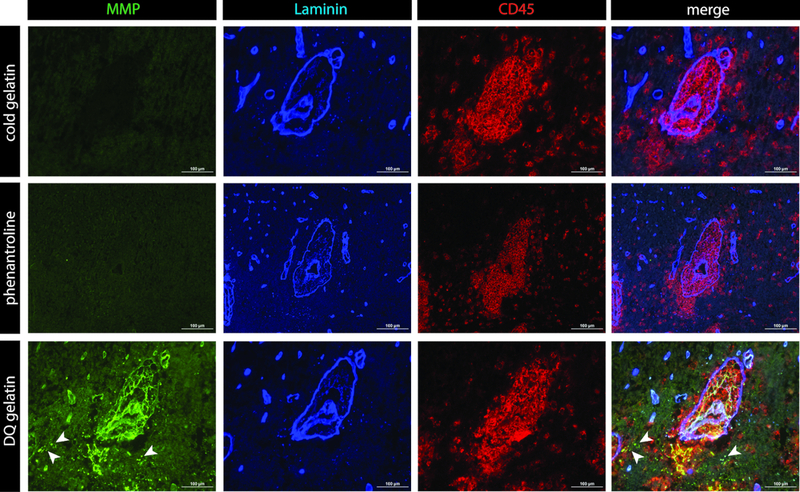 Hawkins, B. T., Egleton, R. D. Fluorescence imaging of blood-brain barrier disruption. Journal of Neuroscience Methods. 151, 262-267 (2006). Graesser, D., et al. Altered vascular permeability and early onset of experimental autoimmune encephalomyelitis in PECAM-1-deficient mice. Journal of Clinical Investigation. 109, 383-392 (2002). Engelhardt, B., Sorokin, L. The blood-brain and the blood-cerebrospinal fluid barriers: function and dysfunction. Seminars in Immunopathology. 31, 497-511 (2009). Owens, T., Bechmann, I., Engelhardt, B. Perivascular spaces and the two steps to neuroinflammation. Journal of Neuropathology & Experimental Neurology. 67, 1113-1121 (2008). Sixt, M., et al. Endothelial cell laminin isoforms, laminins 8 and 10, play decisive roles in T cell recruitment across the blood-brain barrier in experimental autoimmune encephalomyelitis. Journal of Cell Biology. 153, 933-946 (2001). Grewal, I. S., et al. CD62L is required on effector cells for local interactions in the CNS to cause myelin damage in experimental allergic encephalomyelitis. Immunity. 14, 291-302 (2001).